Happy Valentine’s Day! While a lot of Valentine’s Day traditions involve treats like sugary candy that can damage your child’s teeth, there are plenty of other ways to celebrate the holiday with your family that do not lead to sugar highs and cavities. Here are some of our favorite tooth-friendly Valentine’s Day ideas! Valentine’s Day gives you the chance to make the foods that your child eats every day just a little bit more exciting! There are plenty of easy ways to make their normal foods festive. If you make waffles or pancakes for breakfast, try adding a little bit of red food coloring to the batter to make a festive pink color! You can do the same thing with cream cheese for bagels. Some other fun breakfast options include strawberry milk for their cereal, or fresh cut up strawberries. 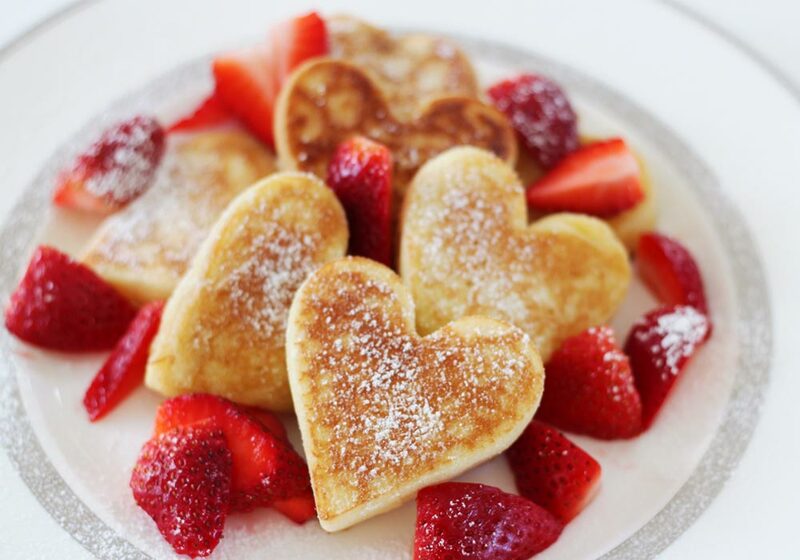 If you have a heart shaped cookie cutter, it is pretty easy to make some heart shaped pancakes or toast! Since Valentine’s Day falls on a school day this year, your child will probably be eating their lunch away from home. The cafeteria may have some holiday specials, but if you usually pack their lunch, keep the festive theme going! Try including a heart shaped sandwich or fruit and veggies cut into heart shapes! This can easily be done with a cookie cutter. We advise against packing candy in their lunch as a treat, as they will probably be getting a lot of treats from their classmates in their valentines. If your child is going to be giving out valentines to their classmates, encourage them to choose valentine cards that include treats like stickers, temporary tattoos, or small toys or trinkets instead of candy. If every student in their class includes a candy treat in their valentines, that adds up to anywhere between 20 and 35 pieces of candy per child at the end of the exchange! Your child teeth (and the other parents!) will appreciate a variety of surprises in their valentines. If you plan to get your child a present to celebrate Valentine’s Day, consider something that will last longer and cause less damage than candy. There are some great classic gifts out there like stuffed animals, flowers, and balloons that will help them feel special and celebrated. You can also give them a toy or game that you know they have been wanting! Another option is to give them an experience. Take them out for a Valentine’s Day dinner or to a movie. Even just a trip to their favorite park or local attraction together can be a lot of fun! Consuming an excessive amount of sugar can cause a lot of issues, especially for younger children. Along with the unpredictable burst of energy and subsequent sugar crash, sugar can damage their teeth and cause painful cavities. Even if your child still has mostly primary teeth, it is important to start oral health consciousness early because cavities in their baby teeth can affect the development and health of their permanent teeth. Moderation is the key to success when it comes to enjoying treats. This is especially important for children on holidays, as celebrations tend to involve a lot of sweets and candy. Be sure to monitor how much candy they are having, and remind them to brush and floss extra thoroughly afterward! No matter how you choose to celebrate, we hope you and your family have a wonderful Valentine’s Day! Is your child due for a dental cleaning? Schedule their pediatric dental appointment with us today! Previous post:All You Need to Know About Fluoride!